All summer long, soup is the enemy. It’s hot, it’s hearty, and it’s the last thing I want to eat when it’s 30C. But now that winter is arriving, the soup’s on nearly every night. Currently, my favourite soup to make is one I just made up: kale and white bean. It of course has lots of garlic as well, some tomato, and I even throw some nutritional yeast in. It’s the total package. Kale is about the healthiest thing ever, and the other ingredients aren’t too shabby either. Everyone at my house loves it. It’s also supergood to send in someone’s lunch the next day. The best part: it’s really easy to make, and uses simple ingredients. Sautee the onion in some olive oil. Throw in the garlic and tomato. Add veg stock, and the rest of the ingredients. Simmer for about 20 minutes. Eat, with crackers or without. I make a soup similar to this all the time except I add a can of diced tomatoes and a pinch of chili flakes. 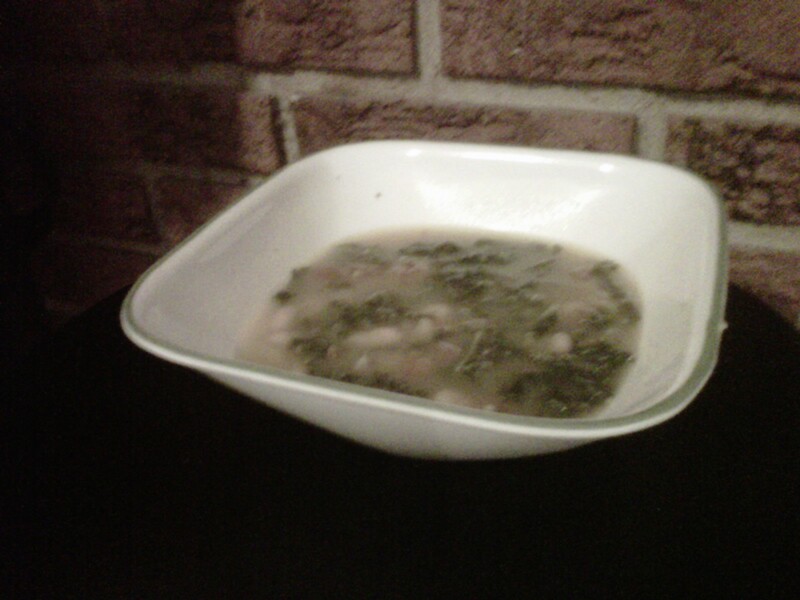 It’s based off this recipe from fat free vegan: http://blog.fatfreevegan.com/2007/02/rustic-red-kale-and-white-bean-soup.html. Sometimes I will use canned tomatoes instead of a fresh tomato, if I have part of a can to use or something. It’s really whatever is available at the time of making the soup. I would love to add chili flakes, but the kids hate things to be at all spicy so I omit them.